Point Pleasant sophomore Peyton Hughes, right, hits full stride during the 4x800m relay event held at the 2018 Battle for the Anchor on April 30 at OVB Track and Field in Point Pleasant, W.Va.
Wahama junior Skylar Riffle leaps into the air during the long jump event at the 2018 TVC Hocking championships held May 3 at Vinton County High School in McArthur, Ohio. CHARLESTON, W.Va. — A busy weekend for most of Mason County. 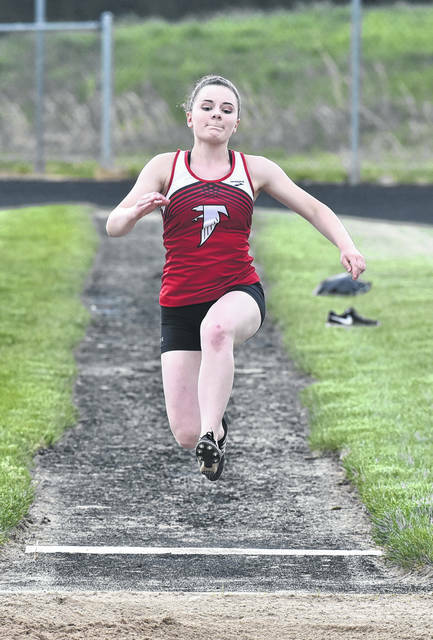 Both Point Pleasant and Wahama will collectively have 34 athletes participating at the 2018 WVSSAC track and field championships being held Friday and Saturday at Laidley Field on the campus of the University of Charleston. Point Pleasant has 23 athletes — 16 boys and seven girls — competing in 24 total events at the Class AA meet, while Wahama is sending 11 athletes — seven boys and four girls — to participate in the Class A event. Hannan, the remaining track program in Mason County, did not have an athlete advance to Laidley Field this weekend. The Black Knights are represented in 13 of the 18 events being held this weekend, including all five relay competitions. The PPHS boys will also have multiple entrants in both the shot put and discus events. Just over half of Point’s 16 athletes are competing at the state level for the first time, but the Black Knights also have seven returnees to help lead the way this weekend. The Black Knights have two seniors — Jesse Gleason and Alex Gibbs — competing this weekend, the only seniors that PPHS will have the state tournament. The duo will also face one another in the discus event, where Gleason is an early favorite to finish on the podium. Gleason also joins junior Eddie Mayes as podium possibles in the shot put. Junior teammate Trevon Franklin adds a third Point athlete in the shot put event. 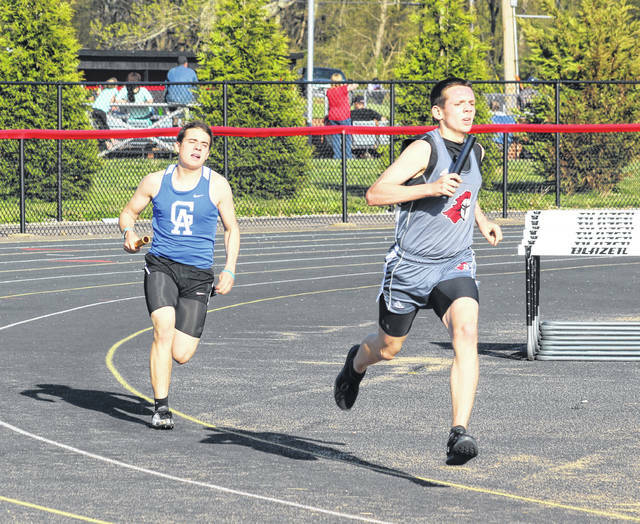 PPHS junior Luke Wilson has two realistic chances to earn podium finishes in the 1600m and 3200m events, while sophomore also enters the pole vault event with a top-six qualifying effort. A trio of the relay teams — the 4×100, 4×200 and 4x110m shuttle hurdles — also enter the weekend with top-eight times, giving each of them a real possibilty of a podium finish. Among the athletes on those relay squads are juniors Cason Payne, Josh Wamsley and Trent, as well as sophomores Jovone Johnson, Garrett Hatten, Zach Rediger, Logan Southall, Brady Adkins and Kaydean Eta. The Black Knights also have a handful of events where they not in the top-half of the qualifying field. Payne will compete in the 200m dash, while Eta and Adkins have challenges ahead in the 110m and 300m hurdle events. The 4x400m and 4x800m relays teams — which include Payne, Wamsley, Hatten, Wilson, as well as sophomores Nick Leport and Peyton Hughes — also have bottom-three times headed into their competitions. The Black Knights didn’t score a single point at the state meet last spring, a first for the program in 15 years. The Lady Knights are represented in 11 of the 18 events being held this weekend, including a trio of relay competitions. The Point girls also have six state returnees out of the seven athletes participating this weekend, including the program’s lone point-scorer last year. Sophomore Sami Saunders has top-three qualifying efforts in both the high jump and pole vault, a pair of events that Saunders placed in last spring. Saunders will also take part in the long jump for the first time. Junior Teagan Hay has the ninth-best time in the 200m dash and is also 11th headed into the 100m event. Junior Allison Henderson is 13th entering the 800m run, while junior Madison Hatfield heads into the 400m dash in the 15-spot. Sophomore Hannah Gleason will be making her state debut in the discus and has a bottom-three qualifying throw headed in. The 4x100m and 4x200m relay teams — which consist of Saunders, Hatfield, Hay, Henderson and junior Sydnee Moore — both have outside shots with the ninth-fastest times in each contest. The 4x400m relay squad of Henderson, Moore, Hatfield and sophomore Ashley Staats also enter the weekend 12th overall. The Lady Knights have scored at least one point at the state meet for 14 consecutive years. The White Falcons are represented in seven of the 18 events being held this weekend, including a pair of relay competitions at the Class A level. The Wahama boys also have five state returnees out of the seven athletes participating at Laidley Field. Christopher Hesson enters the weekend as Wahama’s best overall hope for points as the senior returns to the shot put final with the sixth-best qualifying throw. Junior Brodee Howard returns in the 110m hurdles with the 11th-fastest time, while senior Johnnie Board also had a bottom-three height in returning to the pole vault event. Junior Brady Bumgarner also returns to Laidley Field with a pair of bottom-three qualifying times in the 100m and 200m dashes. The 4x100m and 4x110m shuttle hurdle teams — which consist of Board, Bumgarner, Howard, junior Jacob Lloyd, sophomore Zach Roush and freshman Josh Frye — also enter the weekend with bottom-three marks. The White Falcons have scored at least one point at the state level for six straight postseasons. The Lady Falcons are represented in three of the 18 events being held this weekend, including a single relay competition. The quartet of senior Kaleigh Stewart, juniors Skylar Riffle and Camryn Tyree, and sophomore MacKenzie Barr have a bottom-three time headed into the 4x100m relay event. Barr is returning to the pole vault event with the 10th-best height, while Stewart is coming back to the long jump with the 10th-best distance. The Lady Falcons have scored a point at the state level since the 2013 season. The 2018 WVSSAC track and field championships will begin at 2 p.m. Friday at Laidley Field. The final day of competition will begin at 11 a.m. Saturday.